RIOT V Stream Lyric Video For "Caught In The Witch's Eye"
Shortly before heading out on their Apocalypse Over Europe Tour, the American heavy metal force RIOT V have released a lyric video for "Caught in the Witch's Eye" from their recent album Armor of Light. In addition, the special vinyl pressing of Live At Keep It True Festival 2015 which was previously only available as a bonus CD for the bands latest studio album Armor Of Light, will be out this Friday. The band commented: "We are very excited about a couple of things coming up. First we offer a conceptual lyric video from our latest album Armor of Light on the great Nuclear Blast records, "Caught in the Witch's Eye". On every RIOT record we try to break up the crazy fast songs with mid-tempo groovers, in the great tradition of DIO and CRIMSON STORM. DVS composed the music and Todd wrote the lyrics about a witch that wants to sell your soul to the devil type of tale, she promises to take away your troubles, but you'll end up hating the cost you have to pay! And of course next week we head out for the Apocalypse Over Europe six-week tour with the mighty PRIMAL FEAR! We are very excited and feel this will be a great tour as both bands complement each other and sound similar in some ways, and have powerhouse vocalists fronting the bands! Do not miss this one!" The bands latest offering Armor Of Light was released this year through Nuclear Blast Records and is available HERE. The band, who formed over 40 years ago in Brooklyn, New York and were this year inducted into the prestigious Heavy Metal History Hall Of Fame boast 16 studio albums to their name and a long and absorbing history that can be rivaled by few others. 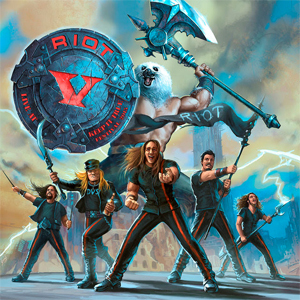 Since their legendary debut album Rock City (1977), RIOT has released numerous heavy metal classics, including Fire Down Under (with classics like "Swords And Tequila"), their masterpiece Thundersteel (1988), and the unforgotten The Privilege Of Power (1990). Catch the band on tour throughout Europe in September/October with PRIMAL FEAR at one of the below dates.